Golden Retriever Freddie was more than just man’s best friend — he was a hero, especially to veteran Ryan Anderson of Galva, Ill.
Freddie met Ryan Anderson during the dog’s fourth tour of duty as a Military Working Dog in the Middle East. Anderson, who worked as a Military Working Dog (MWD) handler, first met Freddie back in 2009 while the two were serving in Afghanistan. Though Freddie started off as a show dog in his native England, he eventually went on to serve a total of four tours as a Military Working Dog — three with the British Army, and his last with the United States Army. It was on this fourth, and final, Middle East tour that Freddie met the handler who would not only be his partner, but his best friend and eventually his family. Though Freddie was an older dog during his last deployment, working the battlefield at 9-years-old, Anderson says Freddie never let up. Anderson and Freddie developed a close bond during their year in Afghanistan. The pair was inseparable both on the job and off. “He’s always had my back. 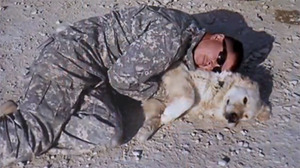 He’s my best friend,” the former soldier adds. In 2010, Freddie developed arthritis and was no longer able to serve in a full capacity. Eager to reunite with the dog who had saved his life on multiple occasions, Anderson jumped at the opportunity to adopt Freddie once the seasoned MWD was up for retirement from the service. “I knew I was gonna take him home, know matter what I had to do,” Anderson explains. After three happy years together in western Illinois, the time came to say goodbye. At nearly 14-years-old, Freddie’s health had started to deteriorate rapidly, and Anderson was faced with every loving dog owner’s most difficult decision. “It’s a day I’ve known that has always been coming for a while. He’s been getting worse and worse,” says Anderson. Wednesday, just two days after Memorial Day, brave and loyal Freddie passed on. Heartbroken at his loss but immensely proud, Anderson tells WQAD.com with tears in his eyes that, though Freddie has passed on, he will continue to honor his brave dog’s memory, service, and sacrifice. “I’m going to have him cremated, and get him a veteran’s urn,” Anderson says of his beloved four-legged friend and partner. Anderson’s young daughter Tara says she will never forget Freddie, who was more than just a special dog to her family.